When I was pregnant with Liam I loved reading other pregnancy and new mom blog posts. 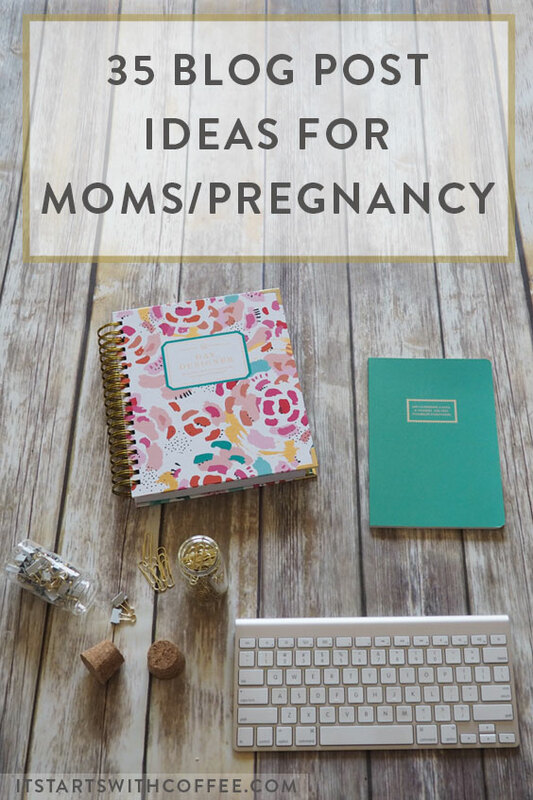 Since then I have written so many fun ones and I wanted to share some blog post ideas for moms/pregnancy if you want some new things to write about! Well there you have it, 35 blog posts ideas for moms/pregnancy! Honestly I could have listen tons more so many I will do a follow up post! But if you are pregnant or a new mom you have tons of ideas of things to blog about now! Day in the life posts with kids at any age are always so interesting to read. Everyone has basically the same structure, all racing home for that mid day nap, but what other moms do with those waking hours fascinates me. Fun ideas. I don’t have my own kids, but I have a lot of kids in my life so some of these would be interesting for even me (and other non-parents). These are some great suggestions! Thanks for sharing! Great ideas! I am currently pregnant with two others at home so I constantly have mom things on the brain but wasn’t sure if I would mostly be writing for me or others if I shared. These are some great topics that I know I would read if others wrote them! Thanks for all of the ideas! My kids are 2, 9 and 11, so I really like the suggestions about seasonal bucket lists, travel and gifts. Could use those ideas for my blog as well! Great post! We are expecting number 8 in the beginning of April. You are so right, the list is endless. Some really good ideas in there. A quick scan and I see a few we’ve done already. But thanks for the inspirations! These is a great list of blog post ideas and is a great resource for moms. I think you covered just about everything. I love the idea of a post on things you wish you’d registered for. I bet a lot of people would find that helpful. All of these ideas are great. I wish I was a blogger when I was pregnant I certainly would have used some of these ideas. This is really good information for mom bloggers. It is easy to fall into a writing rut and not feeling motivated to write anything. I really feel like writing prompts help bloggers recharge their batteries. good ideas! I’ll definitely save these so I can have a guide which one to write first. I have a 6 month old baby and I have unlimited ideas which one to write first, lol. What a great way to put them all together in one place… a great resource!! What a great list. Thanks for sharing this!!! good ideas for the mom blogger. Thanks for the all the great ideas for blog posts about motherhood. I enjoy writing about my journey in motherhood/parenthood and love finding me ideas and inspirations.